Herbs can be some of the most rewarding plants to grow, with even a few plants providing flavouring for many different meals, as well as filling the garden with scent and colour. Many of the herbs we offer can be grown very successfully in containers if you have limited garden space or want to cheer up a patio or balcony. The smallest-leaved basil there is. Finissimo forms a neat round bush which is ideal for growing in a pot. The leaves are tiny (1/2 cm), but have a lovely strong basil scent and flavour. One of Kate's favourites - perfect for growing on a windowsill so that it's always to hand when you're cooking. We had to put these two together! This is the largest-leaved basil we could find. Relatively compact (30cm) plants, but they have large 'lettuce'-type leaves. An excellent sweet basil flavour for salads and other dishes. We like it in tomato sandwiches as each leaf will cover an entire slice of tomato! Note: several people have pointed out that this has a slightly more aniseed-tinted flavour than other basils. We like it! 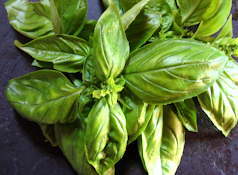 But we also now have a different sweet basil as well - see below. This is a medium-sized sweet basil from Genoa - which we have added for those of you who requested a traditional pesto variety. 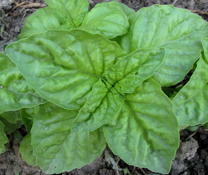 Our latest - and very popular - basil has a real basil scent but with strong lemon flavour. Use it anywhere that you would use normal basil, but we find it particularly good in salad dressings, with fish dishes, and on fresh garden peas. 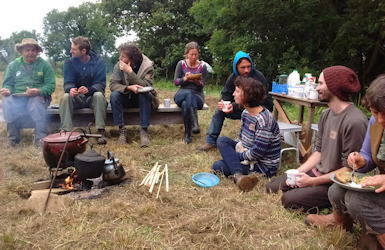 You can also use it to make a nice herbal tea. An unusual variety with an incredible cinnamon scent. The flavour is similar to sweet basil but with strong overtones of cinnamon. 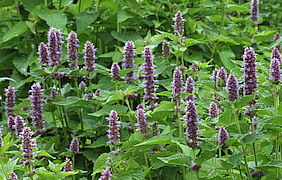 Cinnamon basil has green leaves, and pretty purple flower spikes that seem particularly attractive to bees. Ideal in cooked dishes, and actually its just really nice as a decorative plant - the bush smells delicious when you brush against it. A medium sized bush, green leaves, amazing cinnamon scent. Give outdoor parsley some protection with a cloche or sow a late crop in a polytunnel for fresh leaves right through the winter. 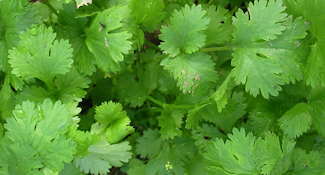 Coriander can also be sown undercover in late summer for harvesting in autumn & winter. This is a nice tightly curled green parsley from France, bred to have good long stalks that hold the leaves clear of the soil, so less mud to wash off when it rains. Parsley will grow well either in a pot or in the ground. We always have a clump on the go in the greenhouse which will generally overwinter in all but the coldest years, and another in the garden over the summer, so it is just to hand when cooking. It has a good strong parsley taste - try a 'pesto' sauce made by blending lots of this parsley, cashew nuts or almonds, garlic, olive oil and a splash of vinegar plus a little warm water if needed to help it blend. Delicious! An essential herb for the kitchen . Tightly curled. 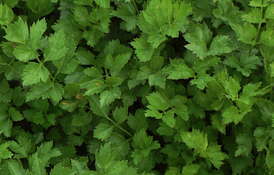 This is a large flat-leaved parsley from Naples, ideal for cooked dishes and for those of you who prefer this type. Vigorous growing with big dark green leaves & a good flavour. Perilla (also called Shiso) is an easily grown, beautiful herb similar to Basil but without such a high heat requirement. The plant in the picture is outdoors in our garden in Wales. It is easy to grow once you know it needs both light and moisture for germination - so sow just on the surface. Sow in small pots/trays under cover in late spring or early summer, just gently pressing seed into the compost without covering. Then plant outside once the weather has warmed up, or pot on into a larger container. Site in full sun or greenhouse for the best scent. A member of the mint family , this strain has leaves that are a deep red-purple colour. It has a “minty-fruity-basil” flavour. It has all sorts of uses. Put it in salads, or add to a dressing. Used as a garnish, the shredded leaves are put on rice, pasta and noodle dishes, or added to soups. Or whole leaves can be fried up with garlic and ginger as a side dish. It is also very pretty in the garden, releasing its scent as you brush past it. 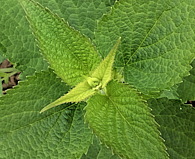 An amazing new herb with large pointy pale green leaves and a delicious sweet flavour between mint and basil. This is a special variety from Korea,with particularly big leaves. Its beautiful, and everyone who saw it in the gardens this year really liked it. You can use it as a herb, and it also makes a very pleasant tea. The latin name is Agastache rugosa, and it is one of the best bee plants we've seen; they just love the beautiful blue flowers. Introduced to the UK by the Romans, and the main ingredient of ‘Herbes de Provence’ mix, this is a piquant herb with a flavour like marjoram, mint and thyme. Used for flavouring beans, stews, soups, casseroles etc. 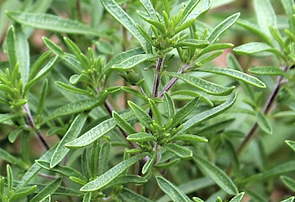 This is another herb we always, always grow so that it is fresh to hand when cooking. It is really easy and we sow short rows regularly throughout the season in the greenhouse or garden. It takes up very little space for the large amount of pleasure it adds to our meals. If you want to grow coriander for the fresh leaves (rather than for seed), it is important to grow a variety selected for this purpose - like this special strain which is very slow to flower, and produces nice bushy plants. Keep well watered and pick very frequently to maximise production, and make two or three sowings at monthly intervals to make sure you always have fresh leaves to pick. Coriander grows well outdoors from late spring through into summer. You can extend the season by sowing under fleece or (ideally) in a polytunnel in early spring or in autumn and then you can have fresh coriander almost all year round. A new strain for 2018 selected for a richer flavour! Chinese chives are an easily grown herb, very useful in the kitchen. Their clumps of distinctive flat leaves have rounded tips and a mild garlic flavour, hence their other common name of Garlic Chives. We particularly like them snipped into an omelette. They actually make an underground rhizome and come back year after year, so once you have a clump established you have them forever. Its name ‘Melissa’ comes from the Greek for ‘honeybee’, and it is a useful bee plant, attracting pollinators to your garden. 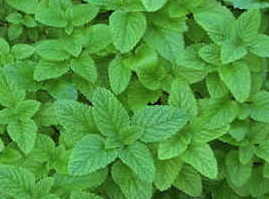 But that is not all - related to mint, Lemon Balm has a very nice lemon-minty flavour, & is used similarly - it makes a very pleasant herbal tea, which is sweet and calming, and also in fruit dishes (as well as flavouring ice-cream if you’re getting really fancy). Pretty easy: Sow the seeds on the surface of the soil in trays or pots in spring, pressing them in gently. Don't start too early as the baby plants don’t like frosty weather. Once they have germinated, pot them up, harden them off and plant them out. Once established, they are make a robust perennial bush, and you can pick the leaves as they are required. If the plants get a bit tired and tatty-looking, you can cut them back to encourage a new flush of growth. Cutting celery is the same plant as normal celery, but bred for lots of leaf production rather than making thick stems. This is a special Dutch strain chosen for dark leaves and a particularly rich flavour. An amazing herb from South America, this quick-growing annual has a nice, intensely spicy-sharp scent, suitable for salsas, or an alternative to coriander. Bright green plants with pretty round leaves grow 2' to 5' tall, and need a warm sunny spot. Ben's favourite, makes fantastic refried beans and chillies. 2' Tall. Nice spicy-lemony flavour. This is another incedible herb that is rarely available in the UK. With a citrus spicy scent and flavour, this is used in South America to make delicious salsa, & can also be used anywhere you would use fresh coriander. 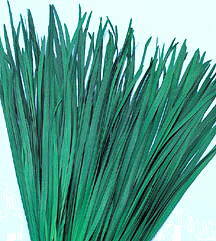 The plants have pointy leaves with an attractive blue-green colour & grow eventually to around waist high. Particularly good with bean dishes and potato cakes. A new herb we've added this year, this has been used in Mexico since pre-conquest days, with a fresh citrusy-cilantro sort of flavour that also has overtones of anise. 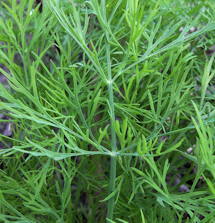 The leaves are narrow like tarragon, and this one is smaller than its relatives above - the plants grow to about 2 ft tall. 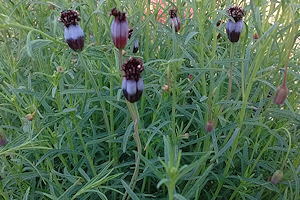 It has very unusual blue flowers without petals, and is very pretty in the herb bed. All of this family of herbs have little glands on the leaves which is what makes the essential oils & give them their unique flavour. 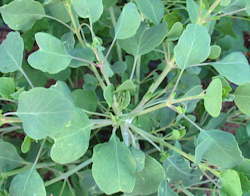 The leaves are chopped finely and added to tacos or bean dishes. It's also good with meats or cheeses - you will like it if you like cilantro. This is a herb used in Peru, with a flavour partway between coriander and mint. The plant is easy to grow indoors or out and though it can get really big in a greehouse or polytunnel you just trim it back to a smaller size if necessary. It makes a delicious sauce that can be used like ketchup. You need: 1 rocoto pepper (HPAL), 1 hot yellow Aji pepper (HPLD) - both with the seeds removed!, 1 cup of huacatay leaves, a small sprig of mint leaves, Lime juice, lots of garlic, olive oil, salt. Put everything except the oil in a blender. 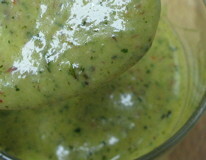 Blend the peppers garlic and leaves together, adding oil until you get a smooth puree, kind of like making mayonnaise. Add salt to taste. Put in a squirty bottle and drizzle liberally over rice dishes and fried things - it's fantastic! If you haven't got the right chillies growing, then you can substitute any medium-hot chillies and it is still pretty good. Dill! Here we have a particularly large-growing strain from Holland. It does tend to bolt (run to seed) relatively quickly, especially in hot dry weather, so sow short rows two or three times over the summer for a constant supply of leaves. The feathery leaves are used in all sorts of fish dishes and cucumber pickles, but also in soups, salads, stir-fry, omelettes, chicken and seafood dishes as well. The plants are very pretty when in flower. Our favourite uses for dill are for potato salad, and in mustard-dill mayonnaise. the seed is very pretty, too. It is different for each herb, but in general with the herbs, you get a lot of seed for not too much effort. You need to grow only 1 variety of each herb (which is pretty normal anyways) to avoid crossing, and let it flower. Let the seedheads dry on the plant, and then cut and hang in a cool dry, airy place until brittle. Usually you rub or stomp out the seed (the rubber mat from your car is ideal for this! ), and then pass it through a sieve to get rid of the big bits of stalk etc. The pictures show basil seed being done by Ben. it doesn't, so you can leave it to get really brown and dry without worry.